I may be showing my age here, but it didn't seem like too long ago that me and my buddies were cruising around the streets of Atlanta calling friends from our "car phone" which was more like a duffel bag that plug into the cigarette lighter. 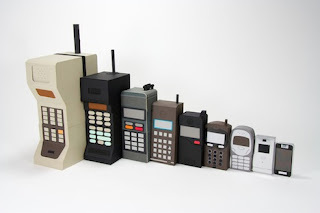 Times have changed, portable phones got smaller (real small) and then started getting larger again with the introduction to smartphones. All of which was a precursor into the corner we are turning now with technology that you can wear. Raise your hand if you remember all of these phones! By now, most of you have heard of Google Glass. The wearable technology that allows you to take pictures, videos and even surf the web all by speaking a command. While Google Glass is still a pre-release product, there have been thousands who lined up to be beta testers of this technology. Overall the reviews that we have heard are positive for the most part. As with the first generation of any product, there are some tweaks that need to be made before they hit the mainstream and become a household product. Expect prices to drop as more consumers grab their pair of Glass. As with anything, once the demand starts to diminish, so does the price tag. The Pebble Smart Watch is On Sale @ Best Buy Starting Today. It should be no surprise that Smart Watches have hit the retail stores today. Well, not all retail stores. 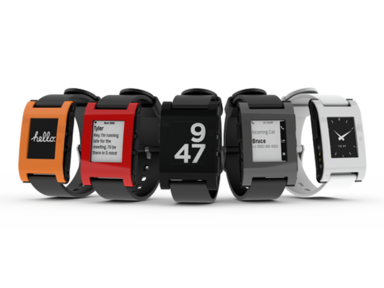 Best Buy and Pebble have teamed up to offer the latest in wearable technology - the smart watch. Initially, my thoughts were that this would mimic the look and bulkiness of calculator watches (showing my age again), but the developers at Pebble had other things in mind. The new smart watch is lightweight and offers you a customized display through downloadable apps for their watch. By linking up with your smartphone through bluetooth technology, the watch allows you to check your email, texts, caller id, listen to your favorite music and more! Both Apple and Google are hot on the heels of Pebble, so it may be worthwhile to sit back and let the competition begin. Although, with a moderate price tag of under $200, if you can't wait ... we can't blame you. Apple has been busy securing patents across the globe for their iWatch and it is always interesting to see what the Google developers come up with. Some of the buzz that we have heard includes a built in GPS feature and bendable display screens. So it becomes that the latest accessory that you need for your wardrobe is --- technology! Quite a journey from the days of the bulky corded car phone. Apple and Google have not yet announced the release dates of their smart watches, but something tells me it will be on my Christmas lift.